"A lot of things were done manually in regards to capturing this population's hypertension, diabetes, other chronic diseases," Mamaril said. It was labor intensive, he added, and involved poring over ICD-10 codes and reports, taking up many hours of valuable time. "Number one, it helps us capture our hypertension patients and form a hypertension registry," Mamaril said. "The great thing about Phytel is not only can they look up their own patient population," Mamaril noted, "but they can actually look at other doctors and how they're doing. They could ask their colleagues how they're doing, what they're doing right. They can share that information, that wisdom with their practice as well." In Mamaril's view, the greater focus on results that AHP doctors have been able to achieve is making a huge difference for patients. "I think it comes down definitely to some engagement," he said, much more engagement than we're used to." In addition to adopting new technology, AHP has also adopted a team approach to tackling chronic disease. They've included a pharmacist and a licensed vocational nurse on board. 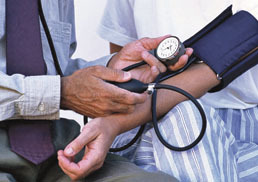 Both can consult with patients with high blood pressure. Some of the blood pressure readings can be taken by nurses or pharmacists, and can free up time for the doctors and other patients as well. "It's really a little bit of a team approach," Mamaril said, "but it's personalized care in terms of looking at these high-risk patients. I think that's the way medicine should be right now. "It's working in the right direction, and it is also being sustained."